About 20 years ago, I tried painting – with very little success. However, the desire to make arty images never left me – and led to my taking up photography in 2002. If you’ve followed my blog post images, you know that I like making painterly photo images. Here I am, back full circle and trying painting again. This is my first effort – pretty weak, but it’s a start and fits my favorite photo genre of moody misty nature scenes. 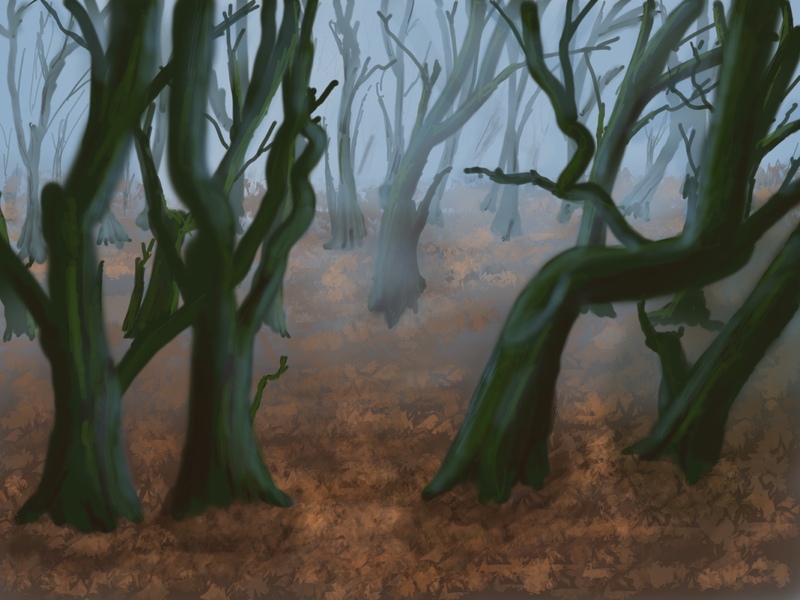 My goal here was to explore haze as a means to show distance (the trees are pretty unrealistic, but that’s a lesson to learn another time). I hope to make paintings of my favorite photos. If I get there, they’ll be posted here side-by-side as they’re completed. There’s a long way to go – practice, practice, practice, …. The scene fits with today being Halloween. This entry was posted in Paint/Draw, Photo of the Day by Ed Knepley. Bookmark the permalink. I think the haze definitely shows depth! Very nice. Not having the talent to paint, or even draw, myself, I think this is pretty awesome. I look forward to more. Have a nice day. Thanks, Rose. Maybe I build on the success of HHPC and start a HH Paint-a-Photo Club. (HHPCC). Thank you for presenting a very interesting photograph.